Some of the games of 2013 deserve more than just a participation trophy. Justin, Ethan, Aaron, Coop, and Jordan settle in for a five part deliberations to hand out The 2013 Grimmys. This finale features stories, music, and the overall game of the year. 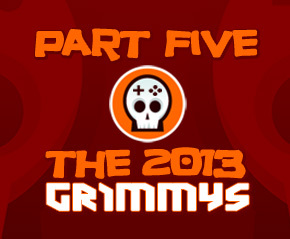 This special episode is a part of The 2013 Grimmys, Horrible Night’s game of the year awards. This show was recorded live on Twitch.tv/HorribleNight. thanks for the 6 hours of podcasts this week. lets just say i drove alot. I knew someONE would find a use for them. We have fun and would do the deliberatiosn anyway, I figure, why not publish it. We got two final hours coming your way. how is their more? craziness. Really I was just curious to see what Cole and Josh though of our picks.